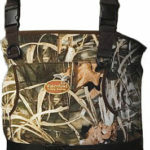 Waterfowl Wading Systems is a sub-brand of Caddis , specialized on waders for duck hunting. Their Max-5 Neoprene waders come in Realtree camo, cost around $80 and are available in a stockingfoot as well as in a bootfoot version. In this review, I will only refer to the Waterfowl MAX-5 Neoprene Stockingfoot Waders, although there should not be a big difference between them. 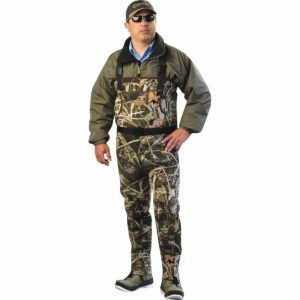 There is a significant difference between what waders for hunting and waders for fishing have to withstand. While fly fishing takes place mostly in rivers, duck hunters have to face dense brushes, sharp sticks, and murky swamps. Following that, their waders should be made out of a reliable and sturdy material. This is why nearly all duck hunting waders are made from neoprene, a flexible robust material, ideal for that purpose. So are the Waterfowl Max-5 waders. 3.5mm neoprene is a fairly popular choice and a good fit as long as temperatures are not getting too chilly, with 40 degrees water temperature or less. The outer shell is additionally made from nylon to provide more toughness and reduce abrasion. The seams are well made, with an exception from the ones around the handwarmer pocket and where the straps are attached. I would not expect them to be very durable, but since they are not mandatory to keep water out, this is not a major issue. In the worst case, you could easily restitch them. The high-density neoprene booties could be a little thicker. When temperatures drop, I tend to get colder feet, so I would definitely wear an extra pair of socks then. First of all, if you are build like me, they probably fit perfectly. I am average sized, no broad build and “normal” legs. They were fitting tightly, but not too tight. No baggy look, the crotch was where it should be. However even if you are only slightly bigger, the cut could turn out to be a problem. I have a friend with an outdoor shop, offering the Waterfowl MAX-5 Neoprene Stockingfoot Waders, and he was letting me know, that these waders only get longer in bigger sizes. So even when you order an XXL size, there is a good chance you will not fit your calves in or have trouble around the waist. Be aware of that, since this could already be a no-go for a lot of people. If you are looking for something bigger sized in the same price segment with similar features, check out the Frogg Toggs Amphib which are only slightly more expensive. Probably the most obvious feature of the Waterfowl stockingfoot waders is the Max-5 Realtree camo. A fairly popular pattern for duck hunting, you can not really go wrong with. On the front side, you will find two D-rings, giving you the possibility to attach a shell holder or calls. Waterfowl also provides the standard big front pocket with bilateral entrance, so they also work as hand warmers on colder days. A big plus is the reinforced knees since they are improving one of the biggest weaknesses of waders. The area of my waders, where I had the most holes in so far, are certainly the knees. When this section is reinforced, you can kneel without remorse which is definitely worth some extra money. The included gravel guards, as mentioned earlier, can turn out to be a big problem because of their attachment clips. Even when you wear a wading belt, which you always should while wading, they still create an unnecessary risk. Although I practiced duck hunting before, I definitely fish more than I hunt. So I tested them in the stream, but also made sure to hike through dense forest for a while. In the stream they performed well, they do not limit your movement, even though the fitting is tight. They also kept me warm during for hours of fishing, even though temperatures start to cool down here and the water was probably around 50 degrees. During that time I switched fishing spots which included a one-mile walk through bushes and forest. I made sure to go tough on them, walking through passages I would usually avoid to not unnecessarily risk holes in the material. After that small hike, I fished another hour and my legs stayed completely dry. 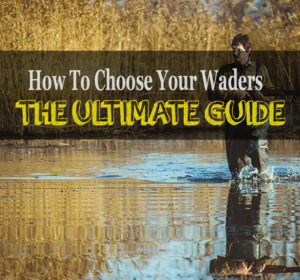 Although that won’t tell you how they perform in the long run, it is at least a good sign for a pair of $80 waders. One thing I have to mention, that could turn out to be a major issue, are the gravel guard holders. If you wore waders with attached gravel guards before, you probably know that there is usually some sort of clip to attach said guards to your laces. The problem with this pair is, that said clip tends to unhinge too easily. This can be dangerous if it gets stuck somewhere in the river, letting you fall. Really nothing you should underestimate. To fix that, I punched a hole in both clips and used an additional metal clip I got from a hardware store. Afterwards, they stayed where they were supposed to stay. Even though I listed more arguments against this pair of waders, for $80 you still get a decently performing pair. They will serve you well for at least one season and the only real downside is the gravel guard clips. If you find a way to attach them properly, like I did, the Waterfowl MAX-5 Neoprene Stockingfoot Waders are a solid piece of outdoor gear! If you are looking for breathable waders check out my Redington Crosswater Wader review and if you are looking for similar waders in a slightly higher price range, check out one of my all-time favourites, the Frogg Toggs Amphib.